Best Android Launcher for you phone to Enhance Looks And Performance Of Your Device of 2019, Then you are at the Right place. 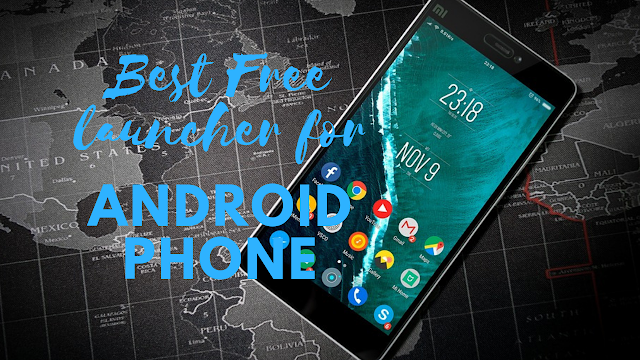 Best Android Launcher: Hi Guys if you Don't know about Best Android Launcher for your smartphone, and you are searching for Best Android Launcher for you phone to Enhance Looks And Performance Of Your Device, Then you are at the Right place. There are many third-party launches available. That replace your default launcher but why you should replace your stock launcher. This cushion has a pretty simple answer. The third-party launches offers lots of customization for user to suit their needs Android launchers have become smarter and feature-rich over the years to save you from the trouble of browsing. Through a hundred of launchers on a store here we compile a list of best Android launchers that you should be trying in 2019 excited. So let's get started! Starting off with the Niagara launcher. The Niagara launcher gives a fresh and neat look to your home screen with the minimalistic UI. It has a unique design and can open applications quickly and use the phone with one hand. Basically, you have the favorite icons here, which could be the contacts in your phone application, etc. On the right side, you can access the other applications on your phone simply by scrolling through the alphabets. Animations are fluent and work perfectly and, in terms of notifications, you can also see the notification below the application icon. This launcher is in development stage right now and soon they'll be support for icon pack shortcuts and so on so if you want to try unique launcher on a phone then download the other launcher right now. Steps next app we have in our list is the Siempo Launcher. The phone for humans same pose a Siempo launcher which transforms your smart phone and helps you to have a healthier digital experience. You can start off with setting up your intention which could be anything. Every time you unlock the phone you will see the task which you have set up earlier the home screen of this launcher is less distracting. You have minimal looking page where you have the useful things such as maps, camera and your phone dialer there's also a page where you can flag apps which you think you use more to waste your time for, example I play PAPG a lot. Now when I flag the app every time I go to this page it will remind about my intention or task which I have set up earlier. The app also batch notifications and you can choose to receive notifications in every 15 minutes or only at a specific time. Overall with this app you look at your phone as a tool and not an obligation so do check it out this unique launcher. The next tab we have in our list is the Flick Launcher. I hope you like "Best Android Launcher for you phone to Enhance Looks And Performance Of Your Device". Flick Launcher which is neither trying on a new concept not. It is something really basic it is still does manage to a stand out though for a very long time. I was using mobile launcher as my default launcher until. I found this one flick launcher pack since so much. It can get a little confusing for a noisy user if I had to make a bold statement. I would say it has many more features than nova launcher and they are not features. You can ignore features like locking apps and folders with fingerprints or password custom action based on proximity sensor make it stand out but by far my favorite thing about this launcher is adding blur to the app drawer background. Its dope there are tons of other things that can't possibly all be mentioned here so, if you are a nova user and wanted to try something new then. I will definitely recommend to try this out. Next up we have Blackberry launcher. Blackberry launcher one that has some really good and interesting ideas, but at the same time doesn't feel quite. There it's pretty fast and it's got the traditional combination of separate home screens and an app drawer and that aspect of it works fine. It's even got swipe up widgets which means that certain icons you can swipe up. It brings up the full widget without actually having to install it on the home screen, but I'd say the aesthetics of some of the elements in this launcher are a little bit unfinished and the fact that if you don't pay for a monthly "blackberry service" there are ads in the app drawer is criminal. Next up we have Kiss launcher and before you start them using some random thoughts about the name of this launcher. Next up we have kiss launcher keep it simple and stupid that's what kisses stands for stupid is exactly. How I thought it looked when I install the app for the first time. It's what I'm using right now and it is extremely smart. Kiss launcher is completely free open-source lightweight launcher. The app itself measure less than 200 Kb and also goes easy on RAM. The main screen shows you history which includes your recent or frequent exist apps calls and SMS. There is a search bar at the top which is the key feature of the launcher. That you can use to search your apps contacts or just search the web using the search provider for all those like me who like to keep, their screen clean this is the minimalist mode this mode hides your history and favorite apps and shows them only when you tap the screen. The next tab we have in our list is the Buzz Launcher. Buzz launcher comes with infinite level of customization. Which you cannot find in any other launcher, if you are a theme or user buzz launcher is the perfect and better replacement of aid. It allows you to customize much more than just your wallpaper and icons. One of the most exciting thing about this launcher is you don't need to make the perfect launcher you can find one from its theme store although the launcher goes too hard on resource consumption. It won't be a problem in flagship device it has over 50 million downloads and user rating of 4.4. It's unique feature called home pack Buzz is a home screen customization service with more than 7 million. Home screen uploaded and shared by thousands of users it has an inbuilt app Locker and RAM cleaner, so you don't need to install any additional app for that a lot of jesters are available with which you can access many shortcuts with just a swipe of your finger on the home screen an additional feature called screen effect, is available within the app which is similar to live wallpaper. But instead of replacing your wallpaper it overlays the wallpaper with animation effects such as snowfall or autumn leaves floating on your screen. You will never get tired of fiddling around all the customization options available in buzz launcher. The next tab we have in our list is the Everythingme Launcher. Everythingme launcher neatly organizes your phone and can recommend. The best app for you home screen folders are created category wise during initial setup. It has customizable gestures and a prediction bar for fast app searching a swipe on your home screen will take you to quick contacts. Where you can find your frequently used contacts we watch is another screen. Where you will find news fields but it is not much customizable the launcher gradually learns from your habit and delivers the best it can. The next tab we have in our list is the AIO Launcher. I hope you like "Best Android Launcher for you phone to Enhance Looks And Performance Of Your Device in 2019". AIO launcher claims to be no ordinary launcher. It has let go of the usual icons and brought you everything you need in the home screen. Itself the main screen consists of semi-transparent layer of widgets which include your frequent apps contacts last SMS news RAM usage battery stat calendar exchange rate and other custom widget. That you add the screen has a dialer so you won't even need to open your phone app to make a call you can add your Twitter email and telegram account and get your messages in your home screen. Itself it also has a floating search icon that you can use to search your app and contact or search the web if not you can just swipe right and access all your apps in your usual way there is also more to the app if you're willing to buy the premium version. Once next up we have Microsoft launcher. The next tab we have in our list is the Ap15 Launcher. Ap15 Launcher is a very light launcher in every sense of the word it has no icons and its size is only in KB's .so how do you think it displays the apps and this launcher there is only one screen so anyone looking to get out too much complexity should probably take a look at this and this screen is list of apps in words not icons and to make it look cool and to improve usability the size of the app name grows every time you click it and there is also option to change the fonts its size and colors among all. The other that displays icons this one does stand out. The next tab we have in our list is the Rovers floating Launcher. Rovers floating launcher may it look like a widget but actually it is one of the most unique Android launcher apps. The nice thing about this launcher is that, you don't have to get rid of your favorite launcher to use. This Rovers floating launcher works on the top of existing launcher and applications it is also highly customizable. The last one on the list is Surely Nova Launcher. The undisputed king of customization which is the most popular nova launcher now some of you might be thinking, why I put this at the last and the reason is actually quite simple most of you guys. Who are watching this video is quite familiar with this launcher. Some of you might be using. It currently as this is one of the most popular Android launcher of all time. For those of you who don't know about nova launcher. It is one of the smoothest and highly customizable launcher. It comes with pure AOSP style launcher, however you can customize. It using any icon pack the best part is the level of customization and performance it offers with around 50 million downloads and 4.6 user rating. It surely uses favorite app because of its simple yet feature-rich interface with the addition of Google now no one launcher surely has no competition left. So Guys, This is my own '12 Best Android Launcher, I hope you find Our Article helpful for you, please do share and comment your thought about this all "12 Best Android Launcher". Thank you!